Debbie Lee and Blake Ackerman. Thursday is the last day USC students can vote for Undergraduate Student Government president, vice president and Senate candidates. 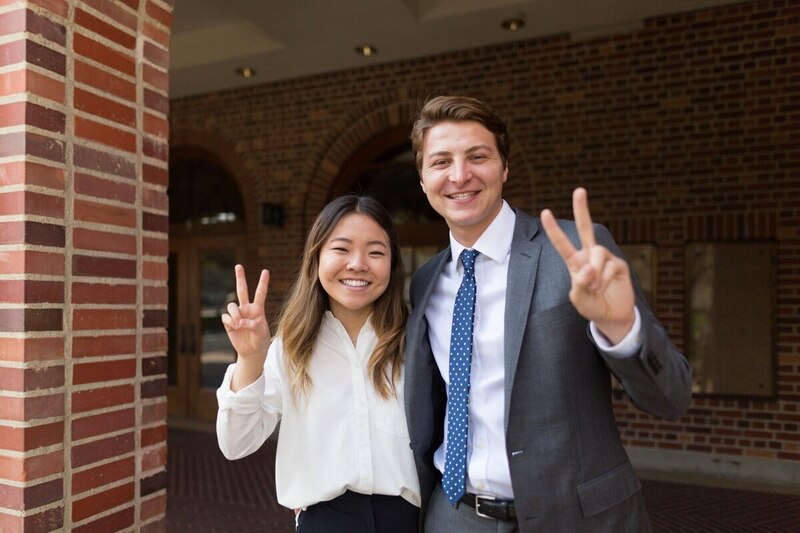 As the student body waits to see which ticket gets elected and which platform points they will pursue, current President Debbie Lee and Vice President Blake Ackerman reflect on lessons they want to pass on to the incoming leaders and roadblocks they never anticipated. One thing Lee realized is that once she got into office, the platform points she prioritized and her perceptions of what was feasible to accomplish changed. "Blake and I were talking a few hours ago about when we were running last year and how excited but also but how naive we were in developing those points," Lee said. "A lot of this role is not only pushing forward your ideas and your initiatives but really learning from what's been set before you and finding solutions together." During their term, Lee and Ackerman served on many committees to work toward finding those solutions. According to Lee, they've worked with the President's Culture Commission, Student Wellbeing Council, Provost and Academic Senate Task Force on Sexual Harassment, Office for Wellness and the new Office of the Ombuds. "My proudest accomplishment is being able to be a part of those discussions," Lee said. "Even if I wasn't sitting in on the presidential search committee, for example, there were still a lot of opportunities to engage in important dialogue about decisions." "Being able to build relationships with so many various campus partners has been such a pleasure with Debbie and I," Ackerman added. While they began conversations about many of their initial platform points in these meetings, they concentrated on new initiatives that weren't part of their original plan. For example, Lee and Ackerman called for speed bumps on the Row and a Greek-university relationship statement in their 2018 campaign, but they pivoted and redirected their efforts when they realized the magnitude of this undertaking. "I think as we were exploring the options about speed bumps on the Row, this is one of the platform points that will probably take many, many years to come," Lee said. "This is something we'll have to work with the city on, especially because 28th Street is city property." Regarding the university's Greek relationship statement, Lee said she and Ackerman have been maintaining good relationships with the Interfraternity Council president as well as the Panhellenic Council. Lee and Ackerman also wanted to improve USG's transparency by publishing their organization's diversity hiring metrics and a line-item budget of where tuition money is going university-wide. While they've started conversations about accomplishing these goals, they're still pending because of legal obstacles. However, Ackerman says the administration is transparent about budgets. "Certain things are protected by legal aspects that we are not privy to," he said. "But you ask someone in the office to explain exactly where that money goes, and they're more than willing to give that to us and provide that information to all students." Despite not accomplishing everything they wanted to, Lee and Ackerman are still proud of the work they've done. "Ultimately, we might've had some major ambitions, but looking back, neither of us are upset with the way our term has gone," Ackerman said. "We're pretty thrilled with how things have gone and the development of different projects we've taken on ourselves." In addition to starting conversations about their original platform points, Lee and Ackerman successfully implemented some projects they didn't suspect they'd complete, including a food pantry and a campus vending machine filled with contraceptives, Tylenol and pregnancy tests. "More and more, [there's a] need to support food insecure and housing insecure students," Lee said about the food pantry. "The need is becoming more pronounced nationally, and it's happening right here at USC." Regarding the vending machine, Ackerman said, "guaranteeing that 24-hour access [to wellness products] is something that we and our predecessors thought was critical for students. 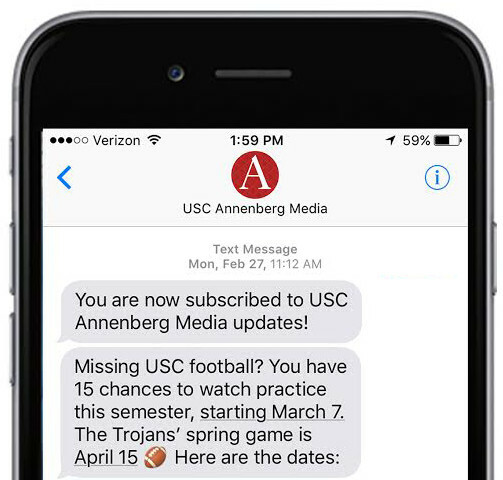 We're really happy with the way it's been installed and implemented, and we're excited to see how students use it." Voting for the new president and vice president ends Thursday, Feb. 7, at midnight, and the new leaders will be inaugurated on April 2. Lee and Ackerman shared words of advice to their successors. Lee recommended "being teachable, be willing to learn and being willing to listen and not necessarily being the first person to stand up and scream your opinions, but to really be insightful and use thoughtful decision-making when fulfilling this role and when pushing out your projects." "Try to cultivate your character into one that resembles respect and integrity," Ackerman said. "Be kind to yourself, be kind to others, and you'll get out what you put into it."